The large luxury segment has plenty of marquee players like Mercedes S class, BMW 7 series, Porsche Panamera and so on. Tesla Model S, soared to the top in 2015 and has refused to cede an inch to the competition ever since. Things have gone in the same direction this year as well. In July Tesla sold 1,100 Model S in the United States. Such was the dominance of Tesla Model S, the second placed Lexus LS can only manage 712 units. Tesla has sold 16,350 Model S in the first seven months of 2018, giving them a whopping 35% marketshare in the luxury passenger car market. Despite a slow start and punching a segment above its $35,000 class, Tesla Model 3 is the best seller in the midsize luxury segment with 38,617 units sold till July. Second placed Mercedes-Benz E / CLS-Class delivered 25,692 units during the same period. 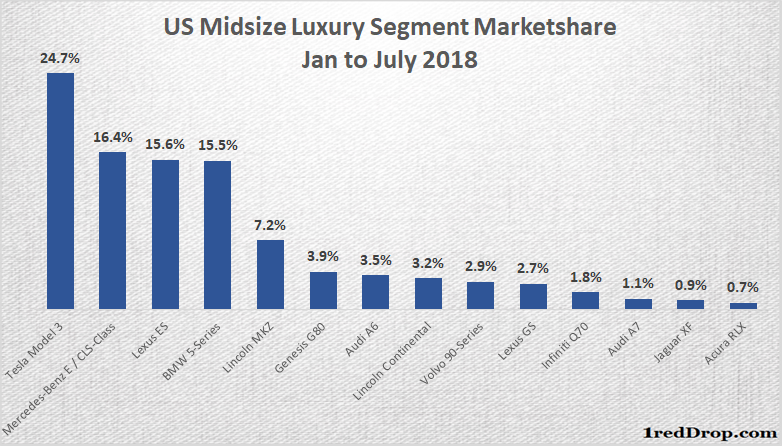 The US Midsize and Small Luxury passenger car segment continued to bleed due to the on going SUV craze in United States. The small luxury segment reported sales of 29,939 units in July compared to 34,257 units last year. The midsize segment sales increased from 22,811 units last year to 29,112 units this year. But if you remove Tesla Model 3, segment sales declined to 14,811 units in July. 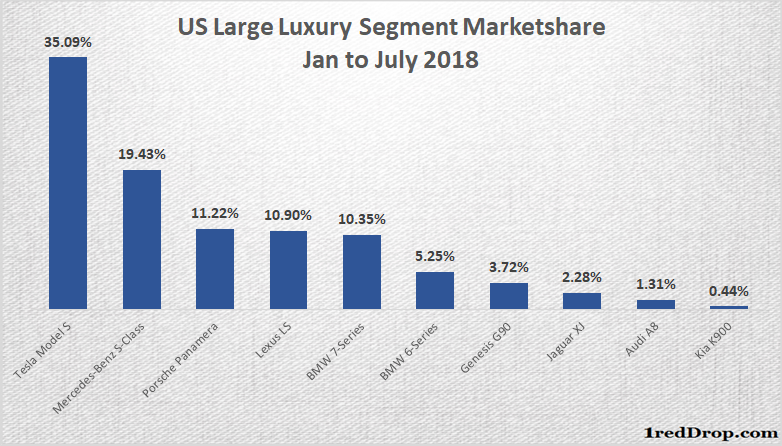 Is it a coincidence that Tesla is number one and Mercedes-Benz is number two in both the segments? Tesla Model 3 outsold all Mercedes-Benz passenger car sales in July. According to Goodcarbadcar data, Tesla sold 14,250 Model 3s in July, making it the seventh most sold passenger car in United States. Not bad for a car with an average selling price on the other side of $50,000.